Where were you working before Metropolitan Capital Strategies (MCS) and what prompted you to go out on your own? Prior to MCS, we were partners at Smith Barney, a division of Citigroup Global Markets, Inc., advising private clients for over 10 years. We realized that we needed to become a registered investment advisor if we were to concentrate primarily on our client’s performance. In order to provide the highest level of returns, we needed to adhere to our three primary investment principles. These are protection of principal and appreciation, loss avoidance, and enhancing portfolio value. As money managers, using these three principles is paramount to ensuring long term growth and, in turn, client satisfaction. To achieve this we developed our own management and trading philosophy which we call FACT, an acronym for Flexible Asset Class Trading. This was our core management and investment strategy that we employed while at Smith Barney, which led to the creation of FACT Funds®. Please explain your firm’s investment philosophy. MCS's investment philosophy is to manage risk in a manner whereby we concentrate on both loss avoidance and portfolio growth. By continuing to re-evaluate the securities and options risk level on a daily basis and taking action when the analysis indicates, we can achieve both of these objectives. By managing risk in this manner, we're able to consistently provide portfolio performance that outperforms the S&P 500 Index. Also, by capitalizing on the inconsistencies in the market place, coupled with this managed risk approach, we are able to employ our FACT Funds ® strategy that has enabled us to continuously provide superb performance. How about describing the firms overall investment methodology.? The trading methodology begins with the utilization of MCS's proprietary algorithms. At MCS, our strategy is to employ the use of individual common stocks, exchange-traded funds (ETF), options, cash, and cash equivalents. In an ongoing effort to provide the best rates of return - while at the same time managing market risk for our clients - we utilize proprietary fundamental and technical analysis to determine the asset allocation and selection of individual securities, ETF’s, and equities. We use a growth strategy based on tactical asset allocation, involving top down and bottom up criteria based on historical data, current market events, and anticipated future investing climates. Along with fundamental and tactical analysis, MCS relies on in depth, quantitative analysis involving all-cap indices. These factors include, but are not limited to; value buys, defensive positions, sector rotation, core equities, and hedged positions. Within the investment process, the sector or industry is the most important factor that determines which ETF’s are purchased. Diversification, as a rule of thumb in any investment environment, is extremely important. One of the greatest benefits of creating a portfolio using exchange-traded funds is the inherent diversification. This intrinsic attribute allows our traders and portfolio managers to capture upside potential in a product, sector, industry, country, region, commodity, or currency, while also minimizing the risks involved in owning individual securities. How does the top-down and bottom-up allocations using historical data help you make better investment decisions? By utilizing a comparative analysis technique to the top-down/bottom-up allocations, MCS is able to cross check for additional risk factors. Historical data is extremely relevant. We start with one factor from the bottom-up approach which should lead to a point that is expected at the macro level. We then take the macro level, or top-down, through a different path this should lead to the same point of origin. If the theory in question is correct, the comparative analysis of bottom-up/top-down should confirm our hypothesis. If not, further investigation is required. In order to analyze each factor on a more advanced level, several different models are created and tested again to confirm or negate this original premise. What criteria does MCS use in its in-depth, quantitative analysis involving indices? We spend the majority of our time and effort researching and evaluating the numerous market indices that serve as our investing benchmarks. Quantitative analysis for MCS involves the use of 25 fundamental categories, 6 technical charts, and 26 economic indicators. With respect to the fundamental categories, first and foremost is the ability of a company to continually raise their profits by double digit percentages year over year. The use of these categories, charts, and indicators have been developed over several decades and are used for their consistent accuracy in assisting MCS in assessing a company’s future profitability, business cycles, and economic environments. This ultimately assists us in the selection of appropriate ETF’s during the final decision making process. Please define Flexible Asset Class Trading - or FACT Funds®. Flexible Asset Class Trading, or FACT, is the methodology behind FACT Funds®. It is a style of investing that allows Dave as CIO of MCS to invest the clients’ funds anywhere at any given point in time or market environment. This quality defines the most important aspect of FACT, the "Flexibility" that money managers should afford their clients. FACT Funds® allow the client to receive maximum returns with minimal market risk through the use of exchange-traded Funds, FDIC callable CD's, and security options. Financial derivatives, or options contracts, allow clients to generate income that is intended to offset fees, increase account value, and limit downside potential in a specific underlying investment. Using these three main investment vehicles provides diversification (ETFs), stability (CDs), and revenue generation (options), which in turn leads to lower risk and greater potential of appreciation in clients' portfolios. One of the Achilles heels of most money managers is the lack of flexibility to utilize cash for any extended period of time. The flexibility to invest anywhere at any time is essential to providing the best performance with the lowest risk. 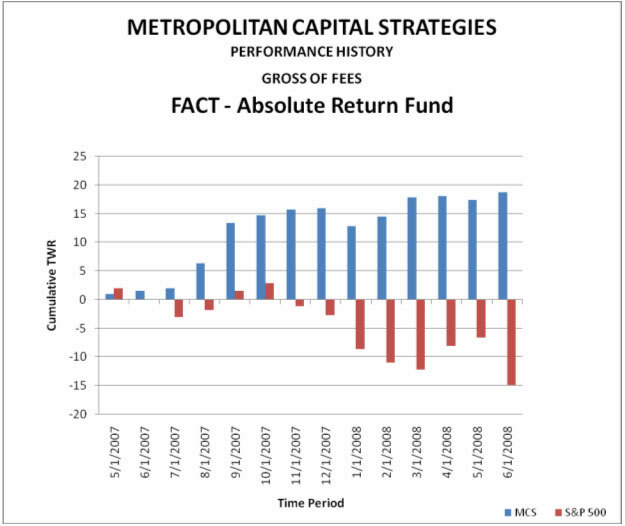 The core operation of MCS is founded on FACT Funds® investment strategy. How important is sector and industry analysis in your investment decision process? The decision making process starts and ends with the level of risk associated with each sector and industry that has passed the initial processing criteria to appear on our radar screen. The macro level analysis requires that sectors and then industry levels are handled in sequential order so that at each stage of the analysis process it can be determined whether or not to proceed with a more in depth analysis of the individual companies. Therefore, sector and industry analysis is always extremely important and is used on a continual basis. Why is diversification important as part of your investment strategy? We use ETF indices that are inherently diversified in most sectors and industries. Diversification is important to any investment strategy but our definition of diversification is unconventional. Our perception of diversification is using the asset class or classes with the lowest risk and the greatest potential for return, and avoiding those areas of the markets that are underperforming at any given point in time. What kinds of investment instruments do you use? Portfolios are typically constructed by utilizing three main vehicles. Exchange-traded funds, Federally Insured callable CD's, and writing covered and uncovered calls and puts. ETFs are evaluated by sector, industry, index, country, commodity, currency, etc. - weightings are related to the risk associated with the business and economic environment. Generally the number of ETFs utilized varies between 1 and 12. Individual securities are used occasionally. Portfolios are monitored as to the business and economic environment on a daily basis. Primary emphasis is placed on overvalued and undervalued conditions. Opportunity for trading occurs approximately 1 to 3 times a year. Cash positions and options are employed continually during the year. What advantages do ETF's have over other investment instruments and how do you incorporate them into your investment strategies? Again, we reiterate the inherent diversification that ETFs provide, as well as the liquidity that is an important aspect of our strategy. ETF’s are also very transparent and cannot be manipulated. They are baskets of stocks traded openly on an exchange where the bid-offer spread is publically available and reflects current market sentiment. In contrast mutual funds are purchased at set prices at the US market close, creating the risk of legal or illegal arbitrage. This issue is particularly acute for International Funds. In addition to the tax efficiency of ETF’s with respect to minimal or total lack of capital gain distributions, ETF’s can be shorted. Using ETF shorts allows for comfort of knowing that at any given time we will not be forced to replace the normally borrowed securities. Simply put, ETF’s provides us the opportunity to instantaneously take advantage of a market price we deem extremely beneficial to our clients. How did you come to develop the investment strategy you are now using, and how long have you been using it? We first realized the inherent, unavoidable risk of overseas overnight trading of individual securities in the early 1980's - which led to the development of a strategy that would minimize or eliminate that risk. MCS is a low risk tolerance money manager. Assessing risk and using our algorithms to decide when and where to invest helps to eliminate a misjudgment. Is your investment strategy purely quantitative or do you use other qualitative factors in your investment decisions? Our investment decisions are never exclusively qualitative or quantitative. We use a tactical combination of both qualitative and quantitative analysis. Do you ever go to cash and if so, are you ever completely out of the market? Cash (money market fund) is an area that we employ to temporarily park our funds after liquidating our positions in an overvalued market. Once the risk factors in the overvalued market are minimized, MCS will position the funds back into the appropriate ETFs. Generally we utilize our cash positions for 3-6 months per year. During that time period we continue to add value to our clients’ portfolios through interest and option positions. In your opinion, what else sets you apart from other money managers? In addition to using our Fact Fund strategy, we are different from most money managers in the way we manage risk, our use of options and cash positions. To expand on this, money managers should constantly measure and manage risk. They evaluate the market risk of equity prices, credit risk, economic risk, global, political and liquidity risk. Most other managers do not use options to mitigate risk even though the derivatives market has exploded in the past thirty years. We have participated in this growth and used many sources to develop and expand on our option strategy. We agree wholeheartedly with the textbook Analysis of Derivatives, which is used in the CFA Program curriculum. According to the highly regarded CFA curriculum, options are typically misunderstood and controversial. They are quite intricate, but provide an extremely beneficial way to increase portfolio value while they minimize risk. Option complexity means that some parties that use options do not understand them well. They have been criticized as being excessively dangerous for less knowledgeable investors. While we do not recommend options in those cases, we believe we understand the market forces that govern derivative pricing and use that to our advantage. We use our algorithms to determine the valuation of option premium versus the risk. In addition, MCS never writes options without several exit strategies in case the options do not perform the way we had anticipated. We believe that no sound investment plan should be made without the use of derivatives to minimize risk. They make financial markets work better and create an opportunity to profit while reducing portfolio risk. Derivatives serve as a form of insurance, which comes with an added premium to our clients. Options do not so much reveal prices as they reveal volatility - the volatility of the underlying asset – which is critical in option pricing. As we have repeated numerous times we usually use ETF’s as our underlying assets. Writing options on ETF’s, not individual securities, also greatly reduces the risk. Our use of cash positions is also unique. Most clients do not want to be in cash and most managers must be invested in the market to a significant level at all times. When in cash it is a common misconception that their money is not working for them. During the time we have money in cash; we write options, collect interest payments, as well as protect the client’s principal. One example of the benefit of our strategy is timely today. The broad markets are down over 20% in the last eight months. We have avoided losses and show positive returns for our clients. We would not have been able to achieve this without strictly adhering to our risk management parameters, using options and cash positions. How do you know when to write options on your positions? Is it possible that option writing might limit your upside potential? Option writing is determined by the overbought or oversold conditions of the market place. Again, we begin by assessing the risk using our proprietary algorithms and write the options approximately 10% plus or minus from the current market price. So far, we have never had a given year where option writing has limited our returns, but rather has enhanced those returns. Typically, a significant portion of the total appreciation results from option writing. How can you consistently expect to return 20% over the S&P 500 average long-term? Our strategy is an absolute return solution. While no business model can guarantee success, the MCS strategy has consistently beaten the S&P 500 by 20% or more over the last five years and is well positioned to exceed that figure this year. We will continue to produce consistent results by following our strategy. The MCS ideology of money management is contrarian to the standard diversification and asset allocation techniques used in the marketplace today. We find the traditional approach of asset allocating into declining assets classes nonsensical and costly to returns. MCS will continue to avoid market exposure when the risk is at a level that exceeds our maximum tolerance. By recognizing certain market risk factors, implementing cash positions and utilizing our income producing options strategy we are very confident that MCS will be able to consistently beat the S&P 500 each year by at least 20% with no negative yearly returns. How is it possible to expect not to lose money in a year when the market averages are negative? With our forward looking analysis process and investing strategy, we position our clients’ portfolios to not lose money by attacking the total money management philosophy from a direction that is original in nature and should set the standard for years to come. Not to sound too redundant, but by focus, discipline and utilizing our various risk analysis tools, and as well as economic and business cycles, MCS is able to steer clear of impending downturns and capitalize on our income producing options. An excellent example of this is a comparison of our 2007-2008 returns with those of the market. The total market is clearly down; choose your own figure, but we see it to be about twenty percent. A look at our results shows MCS is positive by over eighteen percent for this same period of time. We believe the attached charts support our point. Who are the principles at MCS and what are their investment backgrounds? Our President and CIO, Dave Schombert, holds a B.S. in Finance from George Mason University, and a Registered Investment Advisor designation in Maryland and Virginia. After spending 20 years in the private sector as an analyst and private investor, Dave furthered his experience with 10 successful years as a Vice President of Private Client Wealth Management with Citigroup Global Markets, Inc., Smith Barney. Throughout its history, Dave’s strategy has provided positive returns every year. Dave, deciding to implement his strategy with 30 years of tactical and quantitative development, is now a Co-Founder, President and CIO of Metropolitan Capital Strategies, LLC. He is the originator of the FACT Funds® philosophy and leads the company’s investment strategy with his proprietary algorithms. 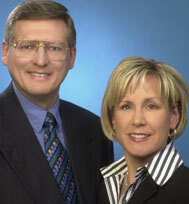 He resides in Fairfax, VA with his wife Gail. Our Chief Executive Officer, Sharon Snow, comes to MCS after six very successful years as 2nd Vice President of Private Client Wealth Management with Citigroup Global Markets, Inc., Smith Barney. After receiving her B.S. in Business Management from the University of Maryland, Sharon owned several different corporations prior to her career at Smith Barney. She now utilizes her expertise at MCS as CEO, assisting Dave with the trading strategy and working with the investment professionals that utilize MCS as money managers for their clients. Involved in leadership and community roles, Sharon has held several board positions and received recognitions including the prestigious Blue Chip Council at Smith Barney. Sharon is a mother of three, and lives in Haymarket, VA with her husband Dan. Dan Snow, Chairman, graduated from Auburn University with a B.S. in Aeronautical Engineering. In addition to his position at MCS, Dan is currently the President of IBDC, I.C.E. Properties, LLC. Formerly, Dan held the position as the President of ICE Components Corp., Founder and former Vice Chairman of Securities Bank Corp., Founder of Beacon North Inc., and former President of Clark Crystal Corporation. Dan looks forward to applying his 45 years of business experience to the exponential growth and success of Metropolitan Capital Strategies, LLC. Where can investors get more information about MCS? Do you have a website? Investors can find more information on MCS at www.mcsmgr.com, or by contacting them directly by e-mail at info@mcsmgr.com or by phone 571-379-8586. Past performance is no guarantee of future results. Investments may lose value. 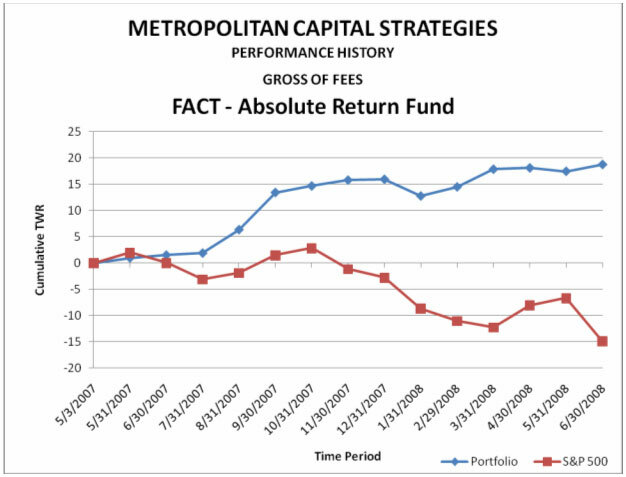 Composite data provided by Metropolitan Capital Strategies, LLC (MCS) for illustrative purposes only. Composite includes all accounts with like objectives. Composite internal rate of return (IRR) figures calculated gross of fees and commissions. Market values on 06/30/2008 based on financial performance figures gross of fees. For further disclosures, please consult the MCS Schedule F ADV, MCS Form ADV Part II, and MCS Investment Management Agreement, all of which can be found at www.mcsmgr.com. The sector weightings and portfolio characteristics are presented as 06/30/2008, and may change without notice. A complete list of sector weightings and individual security positions for any specific period are available upon request. The top ten individual securities presented represent the ten largest positions in the MCS composite based on aggregate dollar value. The specific securities identified do not represent all of the securities purchased, sold or recommended and should not be assumed that the investments or the securities identified were or will be profitable. All information presented is for informational purposes only and should not be deemed as a recommendation to buy the securities mentioned. We believe that the material contains an objective, balanced presentation of the performance of the MCS composite.